Be ready for summer with a sun-kissed, radiant complexion with Voile Doré and soothe and repair your body with Crème Adoucissante. 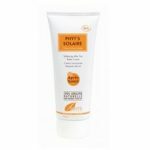 Voile Doré (Self-tanning Lotion – 100g tube): Safe self-tanning lotion for a touch of sun on your skin all year long. Natural tan colour with a pleasant fragrance. Easy to apply. Voile Doré contains skin nourishing Carrot oil, protective Vit E and plant based tan accelerators – Erythyulose and DHA – for a lasting, natural tan. Crème Adoucissante (Soothing Body Cream – 200g tube): Soothing, repairing body cream to be used after sun exposure. 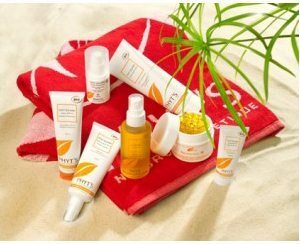 Beach Bag: handy, elegant beach bag made of white towel fabric and embroided with an orange PHYT’S ‘leaf’.